In a rocky, sloping field, a young man wearing latex gloves crouches while an older man holds a camera. I produced another fascinating episode of CBC's The Nature of Things, in which climate change has led to major archeological discoveries. In "Secrets From the Ice", tools and human remains thousands of years old have emerged from melting ice patches in the Yukon and Norway. Follow archeologists as they try to piece together who these ancient peoples were and how they lived - and learn the effects their efforts have had on Aboriginal communities today. The episode debuts November 19 on CBC-TV, then will be available soon after on their website and app with on-demand Described Video. A black beetle eats cereal crumbs on a table. Sometimes it seems just as well that people can't see things - like all the tiny bugs that live in your house or apartment. But CBC's The Nature of Things takes that privilege away with "The Great Wild Indoors", and I help take it away from blind and low-vision people with description of the creepy-crawlies and where they are. (Sorry.) A team of biologists takes over a family's fairly typical house with lab equipment and incredibly powerful cameras to explore a world normally hidden from view. You'll never catch all the bugs, but you can catch this episode of the legendary series August 27 on CBC, then with on-demand Described Video on the CBC-TV website and app (Canada only). On the right, the title "The Neddeaus of Duqesne Island" in a yellow font like those used in 1970s National Film Board of Canada movies. On the left, the Neddeaus sit on a porch. A woman wearing a kerchief holds an accordion, a man wearing a flat cap holds a fiddle and bow, a young man in a fisherman's sweater perches on a railing, and two young women - one blonde and one brunette and wearing a floppy rain hat, sit on the front steps. The National Film Board of Canada has been known for decades for their earnest documentaries of various aspects of Canadian life (I've described more than a few of them.). This CBC digital series purports to be among them, a 1970s relic unearthed from archives, about a family with a very distinct culture living on an isolated island somewhere in the Maritimes. But the narrator is comedian Colin Mochrie, and the family's ways are decidedly... odd. Starting June 12, listen to me try my best to describe their unique lifestyle on the CBC-TV site and app (in Canada only), which includes on-demand Described Video in the player. 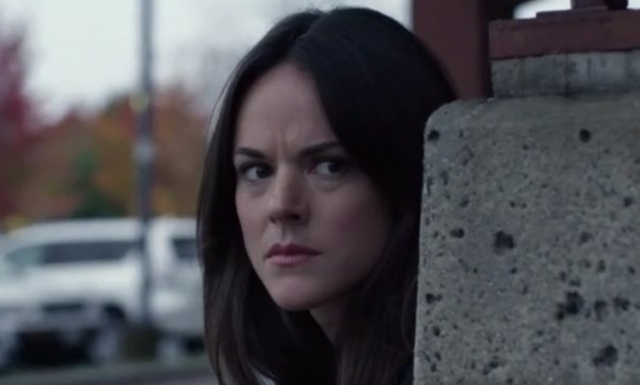 In a still from "Woman On the Run," dark-haired Nomi Gardner (Sarah Butler) looks intently from around a concrete corner. After working on description for many Hallmark movies over the years, I finally got to work on a Lifetime movie! And I do mean a "Lifetime movie" - A woman betrayed by her husband? Check. Fighting for her life in a crazy situation? Yup. "Woman On the Run" stars Sarah Butler as a famous but reclusive crime novelist whose identity is stolen. Can she get anyone to believe her so she can get her life back? Find out and listen for the description I wrote on Lifetime and Lifetime Movie Network, first airing April 29. The title “Chuck & Danny’s Road Trip" is in white block letters against a red map of Canada. A road leading to the Rocky Mountains is in the background, and the round red and white Food Network Canada logo is in the lower right corner. Chuck Hughes and Danny Smiles are Montreal chefs and friends who cross Canada in a big RV to celebrate regional food and the people who make it great. I’ve written description for two fun episodes of Chuck and Danny's Road Trip, where the buddies camp out, learn more about local specialties and then create a feast for the farmers, chefs and experts who have helped them along the way. Check Food Network Canada for their adventures in New Brunswick and a celebration of Mexican cuisine in southern Ontario. A light-coloured lizard, the bearded dragon, stares through the bars of a gate to some food on the other side. Click on the photo to go to the CBC's episode site with on-demand described video. A man with his eyes closed wears a flat, flexible appliance on his head, from the top to part of the right side. The appliance emits a reddish light underneath. Image links to source at cbc.ca. People who become vision-impaired in childhood or adulthood can attest to the concept of neuroplasticity: the ability of the brain to adjust and be "rewired" as they must learn new skills. A man who introduced that concept, Dr. Norman Doige, returns to the long-running CBC series The Nature of Things with fascinating stories of helping the brain itself to heal. In "The Brain's Way of Healing", Doige meets people all over the world whose lives have been changed by non-invasive methods that have improved debilitating brain conditions. I loved writing and producing description to help illuminate the concepts and the dedication of the scientists and patients dealing with everything from Parkinson's to severe autism to massive brain injuries. Catch it in Canada on CBC-TV October 27 at 8pm eastern, and afterward on the CBC-TV app with on-demand Described Video. Beside the purple Ghost Patrol logo (the O in "ghost" is the open mouth of a ghost), two kids walk on the landing of a mansion: Spence has short brown hair, orange glasses and a vest with many pockets. Gabi has brown hair with a purple stripe and carries a backpack. Image links to source image at family.ca. Are you ready for some new family fare for Halloween? I had to be ready in the summer to write description for the début of "Ghost Patrol", the animated adventures of Gabi and Spence (and dog Spooky), small-town ghost hunters hoping for their first big find - and getting more than they bargained for. The fast-paced special is running throughout Disney Channel's "Monstober" in the U.S. and premieres in Canada on Family October 21 at 4pm eastern, returning just in time for trick-or-treat through the last weekend of October, ending with 4pm eastern on the 31st.